International experts are gathering on Iona this week to discuss its globally-important collection of carved stones. The history of the island will also be on the agenda. Historic Scotland and the Iona community are hosting this research workshop to increase understanding of this religious site. The findings will be then be used for events in 2013 marking the 1,450th anniversary of St Columba's arrival in 563 AD. The Scottish governments culture secretary, Fiona Hyslop said: "The anniversary of the arrival in Iona of St Columba gives us an opportunity to celebrate an enduring symbol of Christian art in this Year of Creative Scotland, and identify what new research would help us to understand it better. "This research workshop will draw on a variety of expertise in order to improve our understanding of this iconic site'. 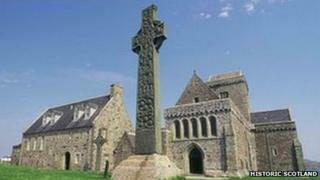 The Iona Abbey, nunnery and collection of carved stones and grave markers are in the care of Historic Scotland. Peter Macdonald, leader of the Iona community, said: "We're pleased to host this conference with Historic Scotland as we seek to learn more about the faith and culture that shaped our nation - insights from the past which may inform us about the values we want to live by in Scotland today." The abbey church was restored at the beginning of the 20th century. Work began on restoring the living accommodation began in 1938, following the foundation of the Iona community. The community continues the tradition of worship first that was first established by St Columba 1,450 years ago.